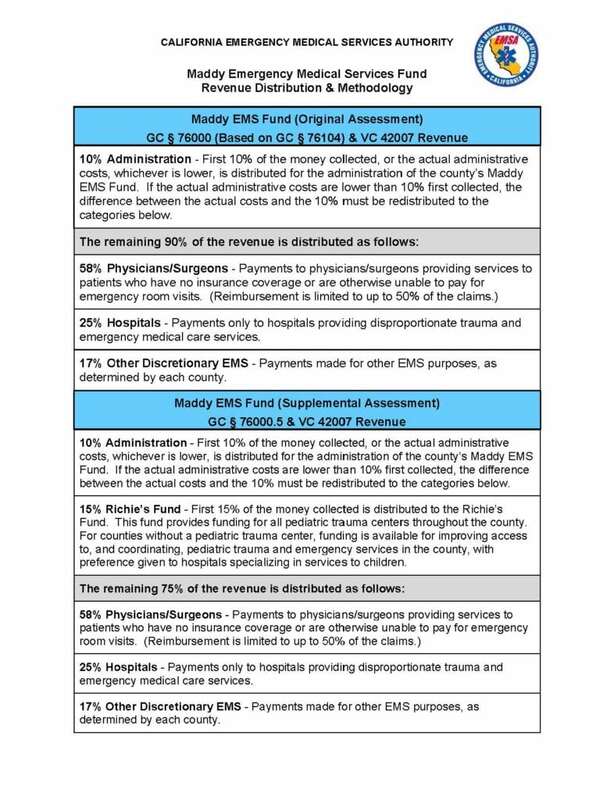 Health and Safety Code (HSC) § 1797.98a authorizes counties to establish a Maddy Emergency Medical Services (EMS) Fund, through the adoption of a resolution by the board of supervisors, to reimburse physicians/surgeons and hospitals for the cost of uncompensated emergency care and for other discretionary EMS purposes. 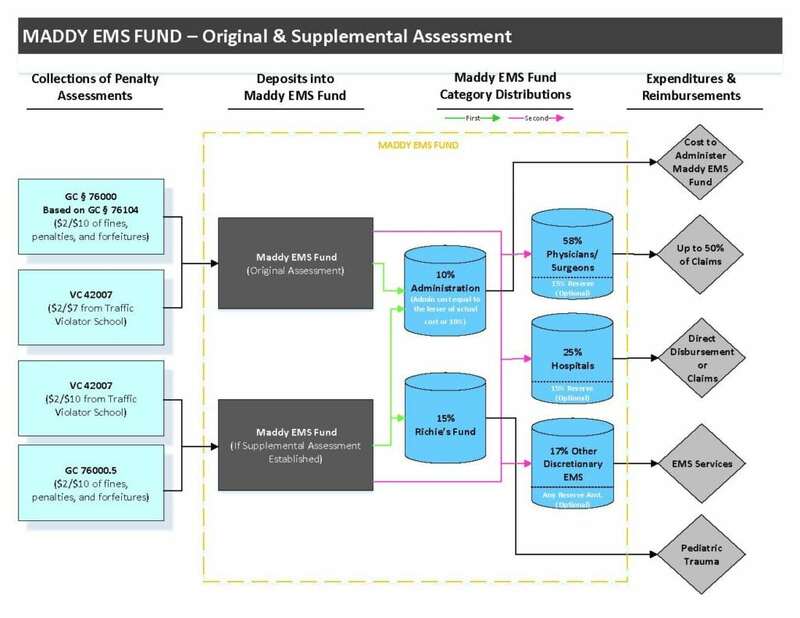 The Maddy EMS Fund is administered by each county, except when a county elects to have the state administer its medically indigent services program, then the county may also elect to have its Maddy EMS Fund administered by the state. 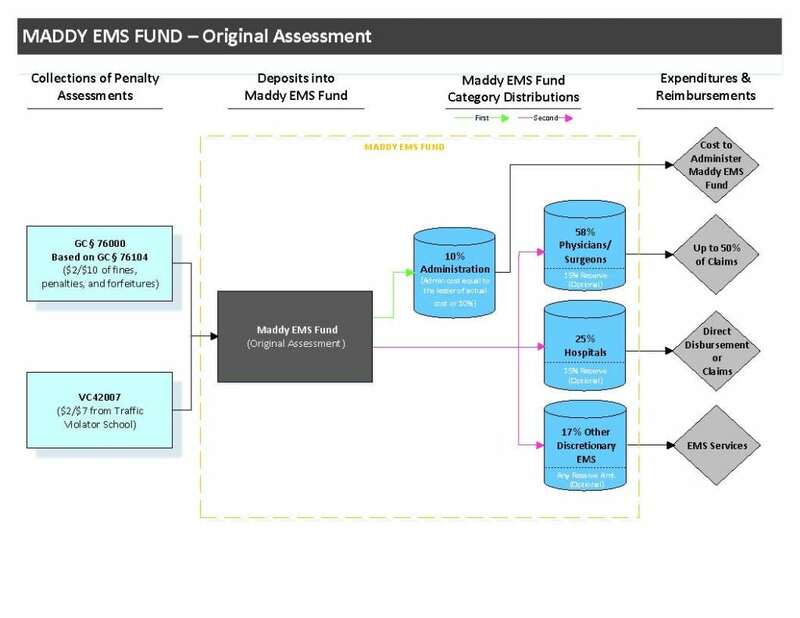 Additionally, HSC § 1797.98a(e) authorizes counties that have established the supplemental assessment, to establish a Richie’s Fund, as part of the Maddy EMS Fund. The Richie’s Fund provides funding for pediatric trauma centers throughout the county. Counties that do not maintain a pediatric trauma center shall utilize the money deposited into the fund to improve access to, and coordination of, pediatric trauma and emergency services in the county, with preference for funding given to hospitals that specialize in services to children, and physicians and surgeons who provide emergency care for children. The expenditure of the Richie’s Fund is limited to reimbursement to physicians/surgeons and hospitals for the cost of uncompensated emergency care. The Maddy EMS Fund (Original and Supplemental Assessment) are funded through revenues generated from local penalty assessments on fines and forfeitures for various criminal offenses and motor vehicle violations, including a portion of traffic school fees, as identified below. Prior to June 1, 1991, fund growth as calculated from FY 1990/1991, or after July 1, 1991, up to 28% of the fund collected under GC § 76000, using the methodology as described in GC § 76104. Original penalty assessment of $2 per $10 of fines, penalties, and forfeitures collected under GC § 76000. Senate Bill (SB) 12 (Maddy, Chapter 1240, Statutes of 1987)/SB 612 (Presley, Chapter 945, Statutes of 1988). Supplemental penalty assessment of $2 per $10 of fines, penalties, and forfeitures collected under GC § 76000.5. SB 1773 (Alarcon, Chapter 841, Statutes of 2006). Penalty assessment of $2 per $7 of fees collected under GC § 76000, and $2 per $10 collected under GC § 76000.5 from Traffic Violator School under VC § 42007.